This is a good, even very good, Bob Mould album, but it doesn't measure up to masterworks like Copper Blue and Zen Arcade. 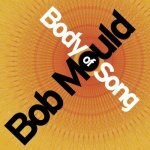 After throwing his fans for a loop with a full-fledged foray into electronic dance music, Bob Mould has returned to recognizable form with Body of Song. This is a good, even very good, Bob Mould album, but it doesn't measure up to masterworks like Copper Blue and Zen Arcade. This record is already being described, quite accurately, as a summation of Mould's career: a bit of this classic disc, a little of that one. Most of it sounds like we've come to expect Mould to sound, but one stylistic element stands out: the inclusion of dance pop sounds from his recent adventure in electronica, Modulate. Husker Du wouldn't have pushed synthesizers to the fore, employed club beats, or used robotic vocal processing, but these elements actually work well for Mould, circa 2005. "(Shine Your) Light Love Hope", which evidences the influence of star remixer Rich Morel, could easily become a club hit, with its four-on-the-floor bass drum, open hi-hat, and vocoder vocals. There's another important new element on the album that's not stylistic, but rather attitudinal: Mould, traditionally bitter while being entirely tuneful, is now apparently quite happy and well-adjusted. Interestingly, the angry songs here ("Circles", "Paralyzed", "Underneath Days") work much less well vocally and lyrically than the other tracks. Of the songs expressing Mould's new, more mature outlook, the standout is "High Fidelity", a bright, wistful ballad in which he yearns for a committed relationship. As wedding bells chime and a church organ swells in the background, he wonders if he's "the only person living who gets no fruit off the tree" and asks, "Who could live with me in high fidelity?" In addition to "High Fidelity", highlights include two picture-perfect power-pop rave-ups and two plaintive, mid-tempo songs thick with atmosphere. "Best Thing" and "Missing You", powered by Mould's signature slashing guitar work, sound like Sugar outtakes, and the vocal harmonies on the latter are pure bliss. "Days of Rain" and "Always Tomorrow" feature slinky bass grooves, spare arrangements, jagged, improvisational guitar lines, and highly emotive performances from Mould, who, on these tracks, is solidly in the comfort zone of his vocal range. In spite of these fine moments, Body of Song falls short because a third of the album -- four songs -- lack the quality of the other compositions. Like "(Shine Your) Light Love Hope", "I Am Vision, I Am Sound" is an attempt at mixing dance and rock, but unlike that song, this one sounds sour and mechanical. Both "I Am Vision" and "Underneath Days" are lyrically simplistic, repetitive, and lacking in instrumental subtlety. In contrast, the last two songs on the album, "Gauze of Friendship" and "Beating Heart the Prize", aim to make grand, complex statements, each stretching more than five minutes, but they end up more unfocused than forceful. After repeated listening, the meanings of these songs still remain obscure. Mould has become more comfortable with himself in recent years and is respectfully coming to terms with the sounds he has created over nearly a quarter century of making music. Though not everything here meets the standards he's set in the past, many of these songs will sound right at home on his fall tour, on which he'll play material from throughout his career. His next album will be a classic if he can focus more tightly on the many positive qualities that make the best material on this record so satisfying.